This week, Airbus is celebrating the fortieth anniversary of its A300's entry into service. 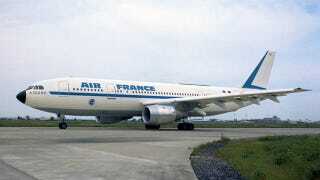 The A300B was the first commercial airliner produced by Airbus — a joint venture between France and Germany. It first flew on September 28, 1972, and Air France took delivery of the first production plane on May 10, 1974, registered as F-BGVA. Production of the A300 and its smaller A310 variant ended in 2007. According to Airbus, 878 A300/A310s (in several configurations) were built, and over 400 are still flown by 65 different customers, primarily in Africa, Asia, and the Middle East. American Airlines was the last one in the U.S. with passenger A300s, but they were finally retired in 2009. However, you can still see them flown as freighters by FedEx and UPS. One A300 type, the A300-600ST "Beluga," is one of the most interesting planes ever to fly. When Airbus first started building planes in the early 1970s, they had to move most of their parts over the road. But they ended up acquiring a fleet of four "Super Guppies" which were modified Boeing 377 Stratocruisers. That led to Boeing fans' quip that "every Airbus is delivered on the wings of a Boeing" - -which had to be a bit of an embarrassment. The Beluga was created in the early 1990s to replace the Super Guppies, and got its name for the bubble-like forehead over the cockpit, similar to the Beluga whale. Throughout the evolution of its production run, the A300 series brought several important advancements to commercial aviation production. It was the first airliner to be manufactured using just-in-time techniques, with parts being flown in from other locations to the final assembly line in Toulouse, France. It was first plane to be fit with wind shear protection, and had an advanced autopilot that could take the plane from climb-out to landing. It was also the first airliner to make extensive use of composite materials in the fuselage.